The latest Microsoft roadmap has apparently leaked via Twitter, and ZDNet was first to post it up. The roadmap contains current plans for all of Microsoft’s big products, including the Windows Phone. What’s new with the Windows Phone that we didn’t already know? Not much really, it just shows that Windows Phone Apollo will evidently release in the fall/winter of this year. Historical release cadence also reassures what Microsoft has already been doing, from then on yearly Windows Phone major updates will release (ie. Windows Phone 8, etc.). 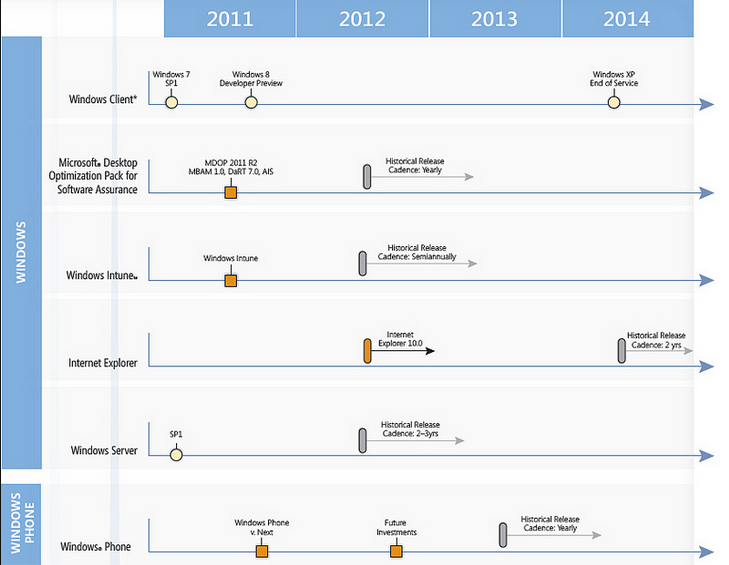 ZDNet has also been contacted since posting the roadmap via email from a Microsoft spokesperson. The email emphasized the following according to ZDNet: “We often provide forward-looking information to our partners and customers under our confidentially agreements with them. This information contains our best estimates and is, in no way, final or definitive.” Right, so under confidentially agreements Microsoft sent a roadmap that is only an estimate. Hard to believe, but take it as you please. Take a look at the roadmap below and let us know what you think about it in the comments below. Is the Windows Phone roadmap too empty or just right?